As the United States became a major industrial power, conflict between workers and factory owners intensified. 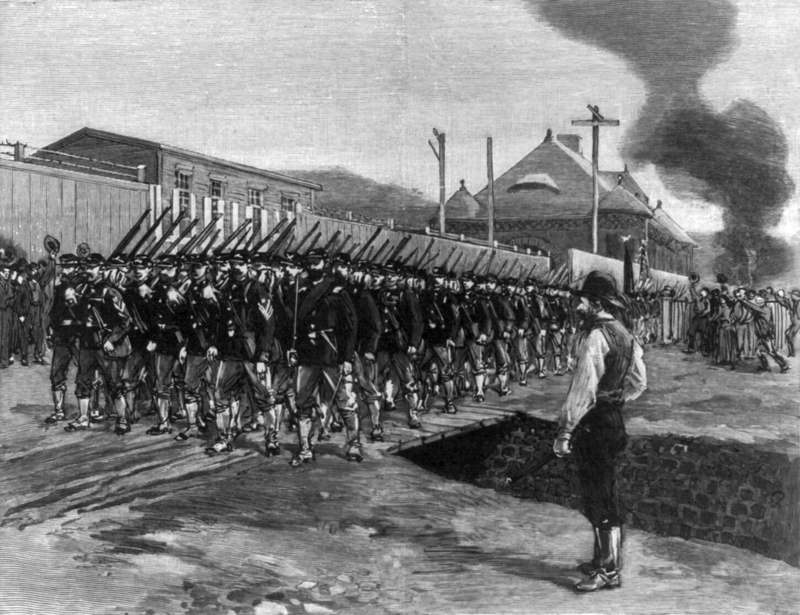 Read about the Homestead Strike and the Pullman Strike, two of the most famous labor battles in American history. As the United States’ industrial economy grew in the late 1800s, conflict between workers and factory owners became increasingly frequent and sometimes led to violence. The Homestead Strike occurred at the Carnegie Steel Company’s Homestead Steel Works in 1892. 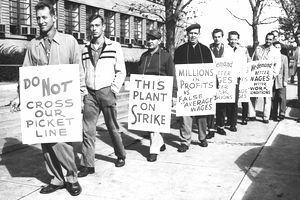 The strike culminated in a gun battle between unionized steelworkers and a group of men hired by the company to break the strike. The steelworkers ultimately lost the strike. The Pullman Strike of 1894 started outside Chicago at the Pullman sleeping car manufacturing company and quickly grew into a national railroad strike involving the American Railway Union, the Pullman Company, railroads across the nation, and the federal government. By the late 1800s the United States’ industrial output and GDP was growing faster than that of any other country in the world. At the center of the nation’s economic success was a dynamic and expansive industrial capitalism, one consequence of which was mass immigration. From 1865 to 1918, 27.5 million immigrants poured into the United States, many aspiring to the opportunities afforded by the nation’s economic successes. The late nineteenth century was a time when industrial capitalism was new, raw, and sometimes brutal. Between 1881 and 1900, 35,000 workers per year lost their lives in industrial and other accidents at work, and strikes were commonplace: no fewer than 100,000 workers went on strike each year. In 1892, for example, 1,298 strikes involving some 164,000 workers took place across the nation. Unions—which function to protect workers’ wages, hours of labor, and working conditions—were on the rise. 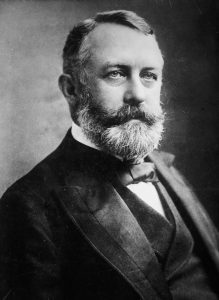 On June 29, 1892, Henry Clay Frick, the manager of the Homestead Steelworks outside Pittsburgh, Pennsylvania—motivated by a desire to break the union of skilled steel workers who for years had controlled elements of the workflow on the shop floor in the steel mill and slowed output—locked the members of the Amalgamated Association of Iron and Steel Workers (AA) out of the Homestead Steelworks. In response, the next day, AA members struck the plant. In the first days of the strike, Frick decided to bring in a group of strikebreakers (commonly called scabs). To get inside the steelworks, the replacement workers would have the daunting task of making their way past picketing strikers who had surrounded the steelworks. But Frick hadn’t hired any old strikebreakers: he decided to hire men from the Pinkerton detective agency, who were technically dubbed “detectives” but who were actually armed men seeking to push past striking workers and forcibly reopen the steelworks. On July 6, gunfire broke out between striking workers and some of the three hundred Pinkerton detectives that Frick had hired. The Pinkerton agents, who were aboard barges being towed toward the side of the steelworks that bordered the Monongahela River, were pinned down in the barges by gunfire from the striking workers. By the next afternoon, with several having been killed on both sides, the Pinkertons raised a white flag of surrender. 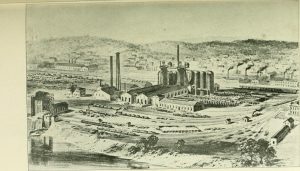 Five days later, however, 6,000 state militiamen who had been dispatched by the governor of Pennsylvania marched into town, surrounded the steelworks, and reopened the plant. The state government had sided with the owners. The union had been defeated. George Pullman was an engineer who designed a popular railroad sleeping car. (Before the advent of cars and airplanes, Americans traveled long distances by rail and slept in railroad cars on the trains.) George Pullman manufactured the nation’s most popular sleeping cars, and Pullman was so successful that he built a company town outside Chicago, where the 12,000 workers who built Pullman sleeping cars worked and lived. But when, in the spring of 1894, amid a general economic downturn and decline in prices nationally, Pullman cut workers’ wages without also proportionally reducing rents on the company-owned houses or prices of goods sold in the company-owned stores, workers struck. 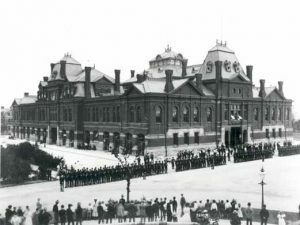 The Pullman Strike, which had begun in May, spread the next month to become a nationwide railroad strike as the American Railway Union, led by Eugene V. Debs, called out workers on railroads across the country in sympathy with Pullman workers. In turn, the railroad companies placed bags of US Mail onto trains striking workers were refusing to move. Declaring that the American Railway Union was illegally obstructing the delivery of the United States mail, rail owners enlisted the support of US President Grover Cleveland. Cleveland dispatched troops to Chicago, ostensibly to protect the US Mail, and an injunction was issued against the union. Debs and other strike leaders were imprisoned when they refused to abide by the court-ordered injunction and call off the strike. The injunction was upheld by the courts, and the strike was ended by late July. Again, government—this time the federal government—had sided with employers in a labor-management dispute. The limits and legal rights of those who own companies and those who work in companies is an ongoing debate in American politics. As a nation equally committed to both capitalism and the rights of individuals, the United States has struggled to balance the needs of corporations and the needs of workers. As in the Homestead and Pullman strikes, government in the late nineteenth and early twentieth centuries often sided with management and against unions. But not always. In the 1902 anthracite coal strike President Teddy Roosevelt threatened coal mine owners that if they did not bargain in good faith with the coal workers’ union that the federal government—would take over control of the mines. The owners quickly capitulated to his demands and the strike was settled. In the Great Depression, the federal government enacted provisions on behalf of workers and labor unions. President Franklin Roosevelt signed the Wagner Labor Relations Act into law on July 5, 1935. 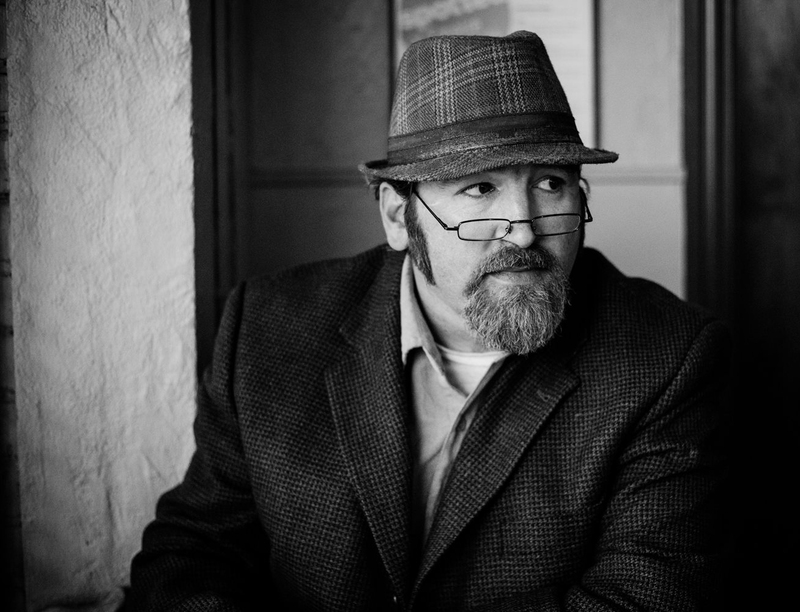 The Wagner Act established federal guidelines for allowing unions to organize and established the National Labor Relations Board (NLRB) as a federal agency to enforce the Act’s pro-labor provisions. In 1947, however, Congress amended the Wagner Act with the Taft-Hartley Act (still in effect today), which restricts the activities and power of labor unions. Originally published by the Khan Academy under the terms of a Creative Commons Attribution-NonCommercial-ShareAlike 3.0 United States license. This entry was posted in History, Politics, United States. Bookmark the permalink.